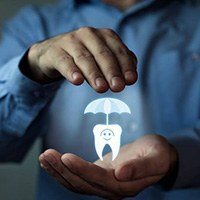 In recent years, fewer of our patients have access to traditional dental insurance as part of their benefit packages and others simply aren’t happy with the coverage they receive. If you don’t have dental insurance or you’re interested in alternatives, the Dolfield Dental team has you covered! We offer an exclusive in-office Dental Savings Plan for our patients to make procedures like dental implants more affordable. We have a variety of savings plan options for you to choose from, so you and your whole family can receive the preventive, restorative, and cosmetic dentistry services you need at a price that fits your budget. Call our team to find out more or schedule an appointment to visit Dolfield Dental. What is the Dental Savings Plan? Adult Dental Savings Plan – patients 14 and up receive coverage for $35 a month after a one time fee of $30. Additional adults can be added for $30 a month and the $30 one time fee. Child Dental Savings Plan – infants to 13-year-old patients receive coverage for $30 a month after a one time fee of $30. Additional children can be added to the plan for $27 a month and the $30 one time fee. Perio Maintenance Plan – patients of all ages who need advanced preventive care for periodontal disease receive coverage for $45 a month and the $30 one time fee. Our Adult Dental Savings Plan cover regular dental exams, cleanings, annual x-rays, and a 15% discount on all other services. Our Child Dental Savings Plan offer the same treatment coverage and also include two fluoride treatments each year to strengthen developing smiles. Our Perio Maintenance Plan includes two periodontal maintenance treatments, two deep cleanings, two dental examinations, comprehensive x-rays, and the 15% discount on other treatments. The easiest way to find out more about our Dental Savings Plans is to call our Owings Mills dentistry office. One of our team members will be happy to answer your questions on the phone or schedule an appointment for you to visit our team. For your convenience, we also offer online registration. On our registration page, you can learn more about plan options, and fill out the online registration form to get started saving today.